The Olympics fever is slowly slipping to the back pages of the dailies, as we are back cheering for Cricket – our unofficial National game. However, I think appreciating the achievement of our girls in the world arena should not be time bound. P.V.Sindhu, Sakshi Malik and Dipa Karmakar deserve all the fame in the world and even more. But, it paves way for a stimulating question – Are they enough? With a population of 1.252 billion, we need atleast 50 Sindhus, 75 Sakshi Maliks and 100 Dipa Karmakars. Where are they hiding? The next famous sports icon of India, the next bestselling author, the next inspiring leader – your child may possess the talent, the necessary vision to become everything. The problem is, are you aware of that? Even if you know that, are you willing to foster his/her talent? Do you have the courage of trusting his/her dream, his/her aspirations? The scenario of girls choosing sports as their career is not a common phenomenon in our country. We are ready to cheer for any sports, sitting in front of the TV, but we are not ready to encourage our children to be in it. The 2011 Indian Census tells us that the urban population in India is over 370 million people, the equivalent of the USA and Russia combined. 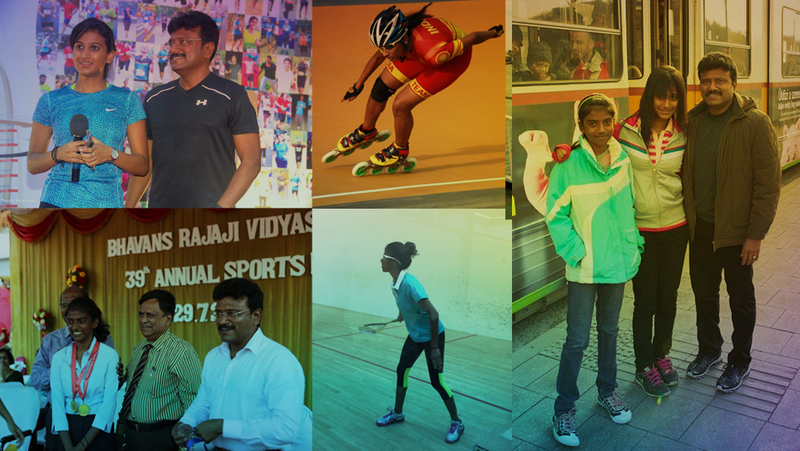 Indian parents tend to give a lot of importance to academics and sports are still considered as a “time pass” activity or just for the recreational purpose. Ironically, still, Parents here have the authority to take the decisions in their child’s life. Start with yourself. Start from your home. Back in 2001, my elder daughter Aarathy witnessed the sport of Skating in a local park nearby. She was fascinated by it and insisted on trying that. Intrigued by the power and speed of the sport, she started going for regular training. Aarathy started her skating career at the age of seven and now she has already won 129 Medals out of which 111 are Gold, 11 Silver and 7 Bronze at various national and international skating events – both ice-skating and inline skating. She is doing her final year MBBS at Sri Ramachandra University. My younger daughter Aaradhana was a skater as well, who had won State Medals and an Asian Media in ice figure skating. She is now more into Squash as a National level player ranked 21st in India in her age category. As a matter of fact, I travel with them always for their competitions in India and around the world. Nothing in this world has given me more pleasure than seeing my daughters engaging in Sports, giving them a lot of exposure in the world and helping them focus on their goals. You may think it may not be necessary to encourage your children to do what they want, as there are other ways to create a successful future for them. But, what else can be a better gift than gifting the future they really want? What to do if you have a budding sports talent in your home? If a talent is found, it is our duty to nurture it. Help it grow; help your child to follow his/her dreams. It will be the biggest gift you can ever give to him/her. Finding a good coach is a hideous task! Remember, the coach is someone who is going to be with your child throughout the entire career, just like you. Analyze their records of accomplishment, history and the ability to get the best out of someone. Never ever, discourage your child or blame them for their loss. Always have some words of encouragement coming out of your mouth. Let it flow, even without your consciousness! Do not let the sports spoil your child’s education and vice-versa. Always keep the school informed about the schedule of your child. The training details, match details and much more! This is an important thing to demonstrate your love and encouragement. They will understand the seriousness,and no doubt, this will kindle them to deliver the best. The world is watching, and you are their world, right? Can you be a selfless friend who claps, appreciates and treats their victories and losses equally? Let us work towards a future where this question is no longer needed! © Copyright 2016 C Kasturiraj All rights reserved.